Putin, 64, said that while work was "entirely satisfactory" overall, "there are nevertheless some delays". "If we relax, we will not fully accomplish the work," he said. 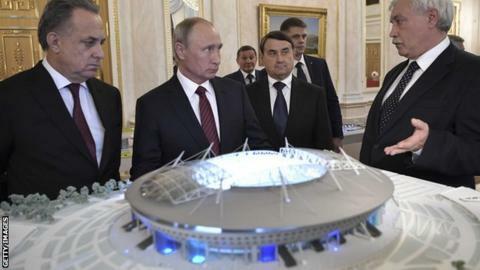 In June this year, Russia hosted the Confederations Cup in a dress rehearsal for the World Cup. The tournament passed without any major incidents of fan violence or problems with infrastructure and was described by Fifa president Gianni Infantino as a "great success". But Putin says the final months of preparation are key to the smooth running of football's biggest tournament. "It is the most difficult thing to resolve tasks at a final stage," he told the TASS news agency. Russia opened an information centre at its London tourist office in September to ease England fans' fears about hooligans. The country has also relaxed visa regulations for travelling fans and will issue special identity cards to make stadiums safer.